Many of my weaves over the past few months have had a lot of feelings of angst, dealing with internal issues, working through ideas, overcoming emotions / working on emotions. You might not see or feel that when you look at my works, but that's what I know I'm weaving. The stories that evolve while the threads are pulling through my fingers. That's the way I weave.... a story telling itself to me, bit by bit. Thread by thread. It unfolds on my loom. Sometimes it changes during the weaving process, it resolves itself, has a beginning, middle and ending. Sometimes it's just a section of the story, and the story continues on in my mind. At any rate, I know when I'm weaving that it's not just stitches and yarn - for me... it's so much more. This piece -- I spent three full days ( as full as full time mother with a child beside her can) at the loom. I've tended the yarn, listened to the story, thought about the end image... what it might look like. At the end of the day, regardless of how much I talk about process, I need to finish these pieces and remember that I'm hoping for someone to love them enough to buy them. That really is what it comes down to - alas my financial life doesn't really allow for much languishing of weavings and yarn. 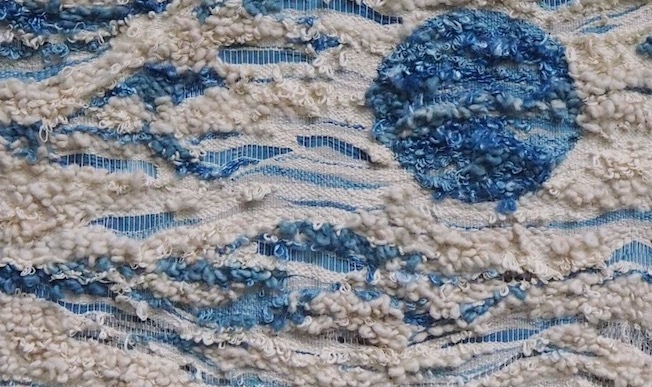 These whites and naturals and blues are feeling much less angsty than previous works. A little more resolved in themselves. Of course, not all smooth sailing as such... but gentler somehow. And then I realised how and why. I am weaving myself. Well, always I'm weaving myself. A version of myself. A story of myself. A story of how I view the world, how my emotions and thoughts and feelings and ideas fit into it. I can't help but do that. My art is a self-portrait I suppose, to a degree. Well, this self-portrait I'm currently weaving is a good one. She's content, she's at peace with herself. She's feeling sad and that bittersweet emotion of the looming death-date of her moth. But she's also feeling good about her space in her environment. Life is not easy, golly it never will be, but somehow things are in a settled space in herself. Even with external issues (children, friendships, finances, vulnerability about 'being an artist'), there's something that is right inside. There's something that is glowing, and blooming. The depth of the blue that I'll be dyeing in my indigo vat is the depth of my soul - it's a good depth... it's not scary or wrong or too deep. It's the space to feel things, to know things, to discover things. It's the space to feel connected to self, to space, to earth, to landscape.